Artur Beese was born on 11 March 1916 at Hörselgau. Beese joined JG 26 in October or November 1939. 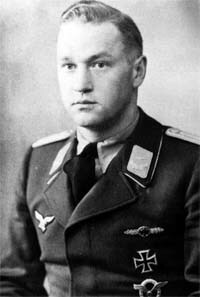 Unteroffizier Beese was assigned to the Stabstaffel of III./JG 26. He was shot down in aerial combat with French Morane 406 fighters near Lille in France and taken prisoner on 1 June 1940. He was released when France fell. Beese participated in the Battle of Britain. On 24 August 1940, Feldwebel Beese, shot down into the Channel by RAF fighters, was rescued unharmed by the German rescue service. Leutnant Beese claimed his first victory, a RAF Spitfire fighter, shot down on 24 July 1941. At the end of January 1943, I./JG 26 was transferred to Russia in an exchange with III./JG 54, who replaced them on the Channel Front. By the time the Gruppe was returned to the Channel front in June, Oberleutnant Beese had 13 victories to his credit. On 20 June 1943, Beese was appointed Staffelkapitän of 1./JG 26. He recorded his first victories over the increasing number of Allied four-engine bombers raiding German occupied territory on 17 August 1943, when he shot down two USAAF B-17s for his 16th and 17th victories. On 8 September, shot down by RAF Spitfire fighters, he baled out of his Fw 190 A-5 (W.Nr. 550 474) “White 2” west of Cambrai. He suffered only minor injuries. Oberleutnant Beese was shot down in aerial combat with USAAF P-47 fighters near Melun in France on 6 February 1944. He attempted to bale out of his Fw 190 A-6 (W.Nr. 531 060) “White 7” but hit the tail and was killed. He was posthumously awarded the Deutsches Kreuz in Gold on 29 March 1944. Artur Beese was credited with 22 victories in 285 missions. He recorded seven victories over the Eastern front, including three Il-2 Sturmovik ground-attack aircraft. Of his 15 Western front victories, six were four-engine bombers.